Posted On November 12, 2017 by Team iCynosure. Mumbai, with its terrible weather, in-commutable infrastructure, increasing pollution and unhealthy food habits takes a toll on my overall well being. Club with these factors, a full-time job and unaccountable responsibilities at home, it becomes impossible to find time for myself; and thus ‘me’ takes a backseat. The lack of time affects two most important aspect of skincare and haircare. Over the last few years, I have taken these for granted and am paying a price for my negligence. When I realized that haircare is a long haul process, I did the next best thing I could think of…. hair treatments. However, the effects remained temporary and my hair continued to deteriorate and the last option was to go back to the old-age formulae of hair oiling and massaging. Unfortunately even with the benefits that oiling brought in, what I absolutely loathed it for the constant tugging at the roots along with the sticky after effect of the product; and thus the application was restricted to weekends or worst only when utmost necessary. 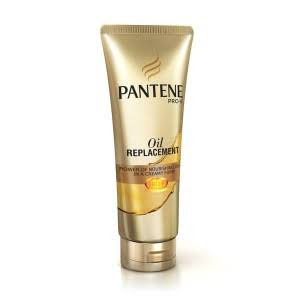 When Pantene announced its new product Pantene Pro-V Oil Replacement, I was excited for a new solution to end the hassle of oiling with a rich and creamy product, that can be used on both damp and dry hair. The product claims to be loaded with the goodness of oils that gives 2X stronger hair. My expectations from the product were the goodness of oil with the benefits of a leave-in-conditioner. With the number of treatments that I put my hair through in the recent times, it became essential that I take steps to ensure its strength, moisture, softness and shine. After about a month of using Pantene, my experience with Pantene Pro-V Oil Replacement has been multi-dimensional with effects such as reduced frizziness, increased strength, and decreased breakage along with a protective layer all along the hair shaft. Apart from the oblivious benefits, the creamy form of the product ensured absorption into the hair while ensuring a non-greasy, non-sticky look and feel. Additionally, the massaging technique helped stimulate the blood circulation which I believe nourishes the hair and smoothens the scalp whilst being a stress buster. Since I’ve started using Pantene Pro-V Oil Replacement, my hair has got a new lease of life; with its perfect modern day blanket solution for lifeless hair, damaged ends to even as a stress reliever. I would most definitely advocate the use of Pantene Pro-V Oil Replacement as opposed to regular oil as it enables styling without having to wash or rinse off the product; so lets say #TelKoTelLagao. § Rub a small amount of the product between the palms. § Apply the product on the hair starting from the top, along the length. § Style hair as usual. § For best results use on wet hair. Have you used Pantene haircare products? Let me know your haircare routine in the comments below. Follow Pantene on Facebook to stay updated on the products and offers.